An Interlochen Arts Academy alumnus and regional representative of the Dramatists Guild of America, I have written many plays, including the manic 60 second play Lovers’ Quorum, a romp with the classics in Ganymede at Studio@620 and Suncoast Theatre, the true story of an abdicating Gasparilla Queen at StageWorks, science fiction horror story The Manatee’s Tale of Extinction at StageWorks, and The Tocobaga Bargain as well as the epic science-fiction radio series Cosmic Significance 2012 and Cosmic Significance Atlantis on WMNF. I have also directed radio theater recorded before a live audience for the Radio Theater Project at the The Studio@620 including Eugene O’Neill’s Before Breakfast starring Bonnie Agan. More recently I have had readings of 3 Gay Guys in Tampa, Miami and LaJolla and my new musical Sunshine City at the Palladium and Opera Central. My grandmother jokes that I studied philanthropy at New College in Sarasota, Florida. Actually it was anthropology, but my studies were certainly inspired by a desire to promote human welfare. I served in the first year of AmeriCorps in the Green Corps and grew up in a family that served in the Peace Corps in Ethiopia during the last days of Emperor Haille Selase. I am a founding board member of the Sustany Foundation, which promotes sustainability in Tampa Bay and currently serve on USF St. Petersburg Creative Writing Advisory Board as well as volunteering for WMNF Community Radio since 1986. I was a founder of Voices for Children, the funding arm of the Guardian Ad Litem program and have worked or served on the board for many organizations including the Florida Public Interest Research Group, Winter Pride Tampa Bay and Heroes of the St. Petersburg Police. Since 1991 I have been helping people online with websites, marketing campaigns, social media and technology training. I have worked with hundreds of companies, non-profits and individuals around the world including favorites like Tampa Theater, WMNF Community Radio, Great Explorations Children’s Museum, American Lymphoma Foundation, Derrick Brooks Charities, Princess Diana Gown Auctions and Mediators Beyond Borders. I started a company called Computer Tutors in 1991 and wrote articles for Computer Friendly Magazine, Creative Loafing and Tampa Tribune about the internet. 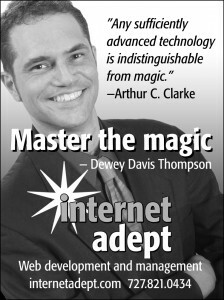 I renamed the company and became The Internet Adept™ in 1996 when I realized I was the first and only web designer in Tampa Bay. Even with new competition I still remain the most dedicated to my clients.